Black bean tempeh is one of the best tempeh's you will ever eat and far surpasses the average soybean variety in both flavor as well as textural quality. There is nothing quite like the taste of tempeh made from scratch using a few basic ingredients, plus a Rhizopus starter culture. While you might be able to mass produce certain other fermented foods like kombucha, miso and cultured vegetables, no commercial product compares to the rich and savory flavors that homemade tempeh can provide. It is one of those undiscovered foods that we feel, in the very near future, will become a more popular handmade commonplace staple and vegan alternative to animal-based protein sources. Once you get the basic techniques down, making your own at home becomes a simple 24 hour incubation process. Essentially all you have to do is cook the beans, let them cool, add vinegar and starter powder, pack the mix into a perforated tempeh bag or container and let the R. oligosporus and R. oryzae cultures do the rest. A homemade tempeh recipe, like our black bean tempeh, is nothing like many of the store-bought brands found in most health food stores. Aside from the handcrafted selections sold at some farmers markets and our favorite brand, Smiling Hara, there are not many commercial varieties we would wholeheartedly recommend. Yes, frozen prepackaged versions are maybe a step up from tofu, but most are soy-based and just don't have the same mushroom-like essence and tender consistency as freshly prepared true blue tempeh. Home-style tempeh is additionally very cost effective. You can literally make over 10 times more for nearly same cost as a purchase 7 oz product. That is a huge savings! 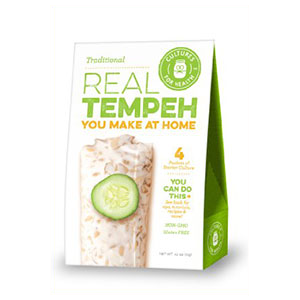 For those of you not familiar with tempeh, it is a fermented "bean cake" traditionally made from soybean and originally came from the Indonesian island of Java. Unlike tofu, which is made by coagulating cooked soy milk into an unfermented "bean curd", tempeh is created by fermenting the whole cooked beans. For more information about tempeh, please visit our page entitled: What is Tempeh? This is achieved by adding a spore culture starter, Rhizopus oligosporus or oryzae, to the beans and allowing it to spread a white mycelium-like mass throughout the pressed whole or partially processed beans. This starter helps bind the beans into a solid block, about 1/2-3/4 of an inch thick, and will take on the form of whatever you're fermenting it in. From here it can be sliced into squares, cubed or cut out into round burger patties. This black bean tempeh is up there with our garbanzo bean variety and black-eyed pea recipe in both taste as well as nutritional components. Consuming beans in their fermented state increases their digestibility as the Rhizopus culture works to help to breakdown food-specific nutrients, providing greater absorption of the vitamins, minerals, and amino acids. 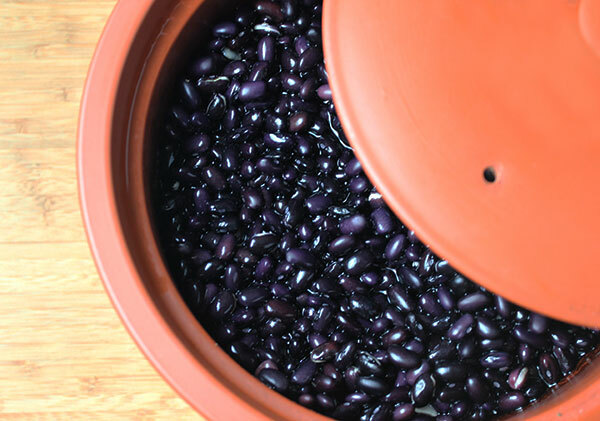 The beans, in this case black beans, are essentially predigested by enzymes created by the spore culture, which is known to decrease certain "anti-nutrients" or digestive inhibitors. The Rhizopus species, as it spreads, deactivates trypsin inhibitors and reduces raffinose-type oligosaccharide content that makes beans hard to digest for a number of people. In one study published in the journal Food Chemistry, the Rhizopus oligosporus culture was shown to be effective at reducing flatulence compared to the unfermented beans. 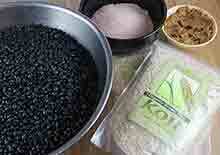 Aside from the enhanced nutritive features and textural qualities, black bean tempeh is also not made from soybeans. Soy-based varieties are not always suitable for all people as they are a source off isoflavones, a class of phytochemicals that are a type of phytoestrogen. Black beans have a dense meaty texture that make for a great tempeh and are a better choice for some people who are trying to avoid soy-based foods. You can also use other legumes like pinto, mung bean, black eyed peas and garbanzo, in addition to many assorted grains, nuts, seeds and seaweeds. In this black bean tempeh recipe we also add in kelp seaweed for added nutritional benefits, but it is not completely required and can be left out if you're not particularly fond of sea vegetables. The thick varieties like kombu and wakame do tend to combine very well in homemade tempeh recipes. 1) Soaking and Cooking the Beans - The beans should be soaked for at least 24 hours and rinsed before the cooking process. 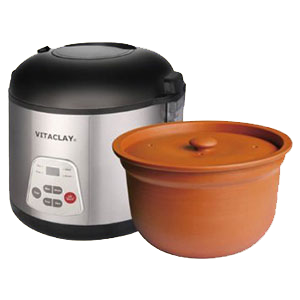 The easiest way we have found to cook beans is to use a crockpot as it tends to speed up the cooking time considerably. It is best to prepare the beans until they are barely tender or slightly underdone, the fermentation process will continue to "cook" them. When overcooked they have a tendency to develop a less desirable texture. 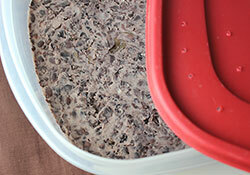 2) Choosing a Container - Tempeh needs a ventilated container or bag to properly culture in and mold the bean cake. While we are not big fans of using plastic bags or containers, they are currently the best types to use for the fermentation process. We personally prefer hard food-grade plastic over bags that may potentially leach plastic particles into the tempeh as it warms and produces heat. 3) Perforate Your Mold Form - Whatever you decide to use, your bag or container should have holes in it so that the tempeh can "breathe" as it cultures. For bagged tempeh, this can be accomplished by perforating it with holes using a fork. For containers you will need to drill the holes on the top and bottom of the tub about an inch or so apart. This is how to make your own personal tempeh-making container that can be used again and again. When using a container the mold culture will grow up off the tempeh cake creating a white fuzzy-looking appearance on the very surface. This is normal and is flattened when the solid block is flipped upside-down from the container. 3) Use Sanitized Tools and Equipment - It is always best to thoroughly clean your utensils, bowls and tempeh-making tubs in hot soapy water. 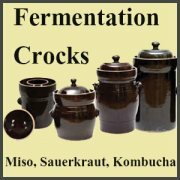 This is standard when making any fermented food to avoid potential contamination. It is usually rare, but it can happen. 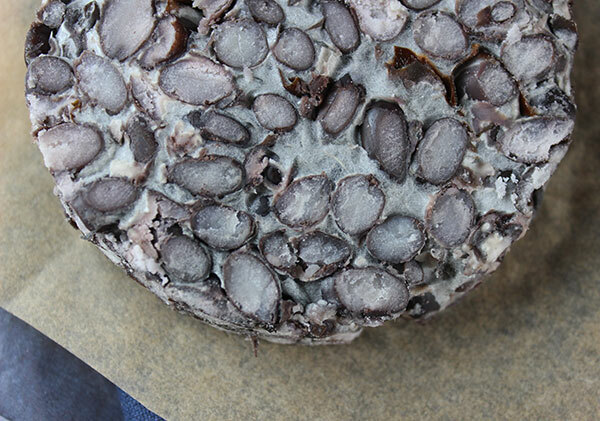 4) Creating the Desired Texture - You can create a number of different textural qualities by using straight cooked whole black beans, partially mashed beans or semi-processed in a food processor. Using at least 1C of mashed beans allows the culture to proliferate faster. Basically tempeh will take on the shape of whatever mold you are using and typically is usually spread out about 1/2-3/4 inches (1-2 cm) thick. 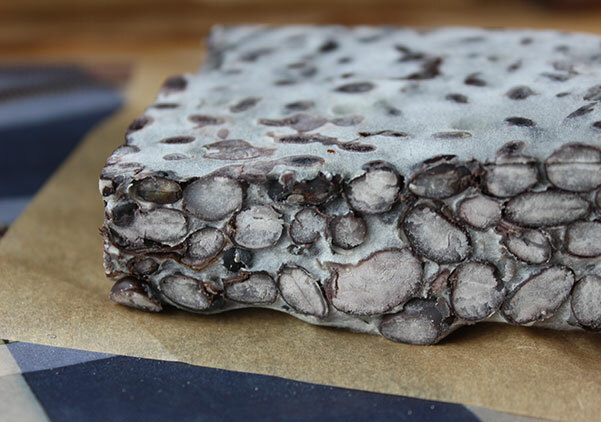 5) Fermentation Time - When appropriately fermented, tempeh should be fully inoculated with white mycelium spreading throughout the cake with no "uninhabited" sections. It is best to stop the culturing process before (or soon after) it begins to sporulate or produce darker patches. Some people do, however, prefer to incubate it for much longer, but we have found it to be less palatable after a certain point. We generally ferment our tempehs for 24-36 hours or a day and half. 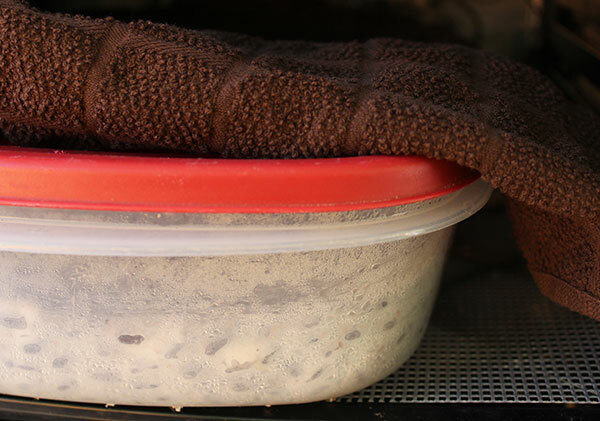 6) Making Your Incubator - Tempeh needs to ferment at a consistent temperature between 85-90°F (29-32°C). 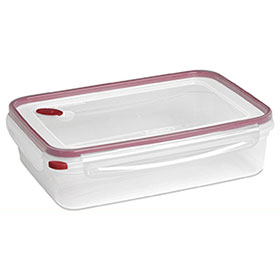 Tempeh incubators can be created using a medium-size plastic storage tote with an electric heating pad set at appropriate temperature. 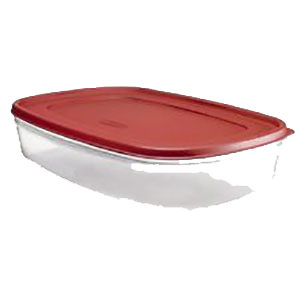 The culturing tempeh bag or tub should be slightly elevated by placing an upside-down bowl underneath to ensure good air flow. You can visit our page listing different incubation techniques for more helpful ideas. 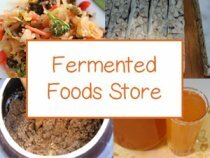 7) Culture Starter - The Rhizopus oligosporus and Rhizopus oryzae spore culture needed to make tempeh can be purchased online through our linked suppliers. A small 100g bag will make over 100 pounds of tempeh. 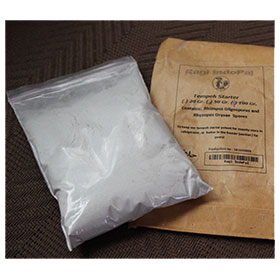 The spore culture can be stored in the fridge or freezer in a sealed bag or jar and will usually remain viable for several years. Our favorite tempeh cultures are Indonesian sourced and include both the Rhizopus oligosporus and Rhizopus oryzae species. 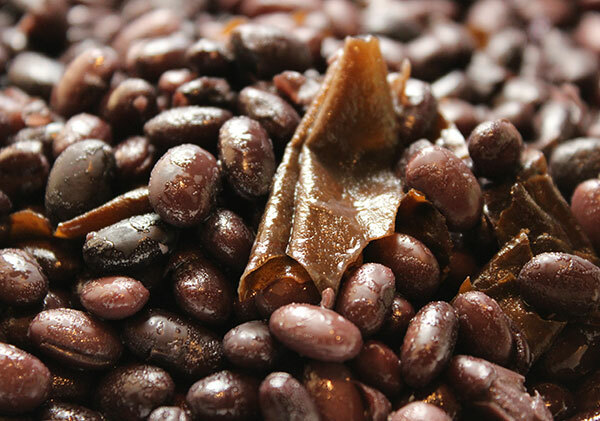 Soak the black beans overnight in pure water and rub briskly to loosen hulls. 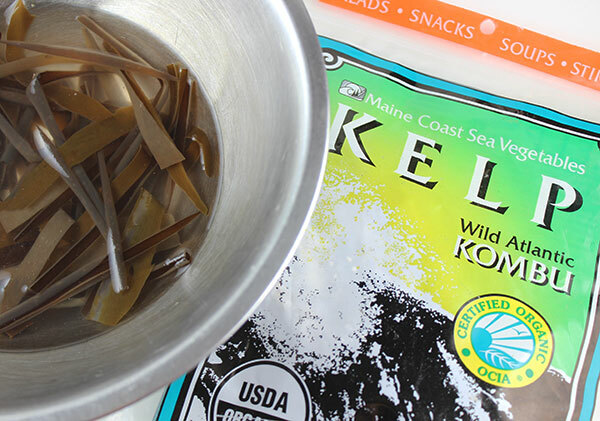 In a separate bowl also soak seaweed strip pieces if using kelp as an ingredient. 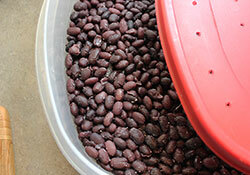 The next day, briskly rub soaked beans one more time, strain and rinse. Cook the beans in adequate amount of water until barely tender or slightly underdone. Remove any hulls that float to the surface. Strain the beans and allow to cool to body temperature or warm to touch; not to hot or to cold. Lay out on a clean surface and dry with a clean towel to remove excess moisture. Add the beans to a large bowl. Keep them whole or partially mash 1C with a fork. Add vinegar and mix with a spoon. 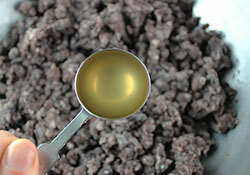 Next thoroughly mix in the powdered culture starter. Stir in the strained kelp pieces or strips. Place the pre-cultured blend into a bag with fork holes or a plastic tub with drilled holes. 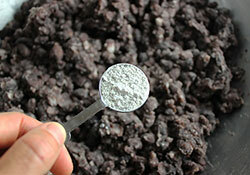 Press the bean mixture down firmly into your desired mold form, again usually about 1/2- 3/4" (1-2 cm) is a good thickness. Place in the incubation chamber (slightly elevated) above heat source. Allow to incubate at 85-90°F (29-32°C). 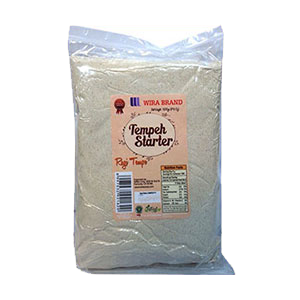 If you start your tempeh at 12 noon, it will usually be ready by 12 noon the following day. Cut your tempeh into meal-size portions. This recipe usually makes about 8-10 tempeh cakes. 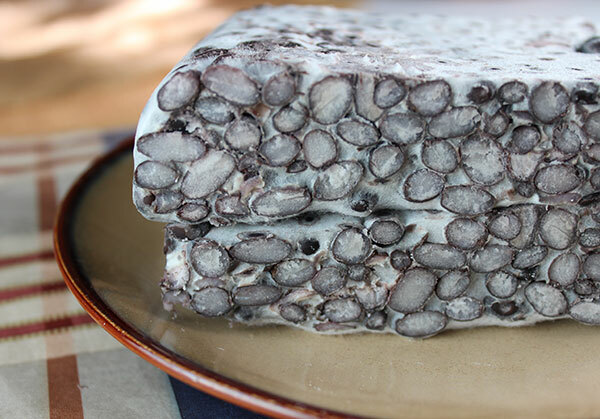 Your black bean tempeh can be wrapped by the slice and stored in the fridge for up to 5 days or in the freezer for long-term storage. Excess heat or moisture content can be a problem and will create an inedible food. Usually this is very evident with a strong foul ammonia-type smell. 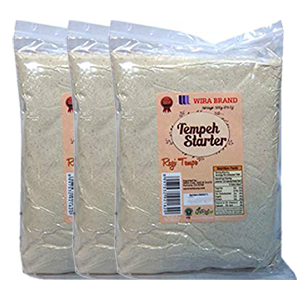 Your tempeh has gone bad if it is slimy, mushy or wet and may have only small broken up patches of the white spore growth. It is pretty noticeable when this has occurred. If so, you must discard the batch and try again. Keep in mind that freshly made tempeh naturally has a strong, but pleasant mushroom-like aroma. Visit our other page on how to make tempeh for beginners. While black bean tempeh can be eaten without heating, it is more palatable when cooked. 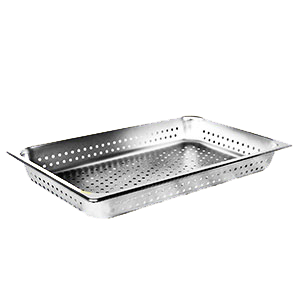 It is often prepared by grilling, frying, sautéing or steaming as slices, cubes or burger patties. When pan heating fresh tempeh we always recommend using a high quality coconut oil or red palm oil, which are healthier fats to use for cooking purposes. Tempeh is commonly served with dark leafy greens and grains like millet, quinoa or rice. 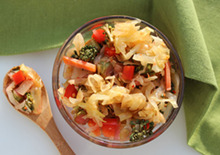 It is also excellent in chili, soups, stir fry's, salads and makes a great sandwich alternative to deli meats. 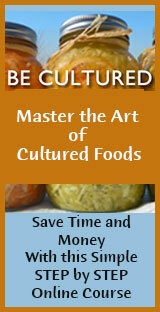 Tempeh should be avoided by people sensitive or highly allergic to molds or allergic to certain legume varieties.